For the past weeks, I have been nursing this craving of mine. Before I delve into details of the dish, maybe I’ll let you in on the root of this ‘obsession’. You see, I’m a big fan of Korean Dramas; at least only the good ones. I can still count with my ten fingers, the number of K-dramas I’ve watched. I pick and choose and go by recommendations. My utmost favourite is still the food-themed My Lovely Samsoon. However, I recently watched a new Korean drama which I like just as much as My Lovely Samsoon. It’s very much a romance comedy and it’s called Fantasy Couple. It helps that the lead actor Oh Ji Ho is easy on the eye. So most of the time, it was just me drooling over the eye candy…. and something else in the drama – jja jang-myun. Jja jang-Myun is simply black bean sauce noodles. The female lead loves this noodles and has it almost everyday. So you can imagine what I’d be doing when she slurps so enthusiastically in every episode. I find myself craving for the noodles she’s having. Black though it might be, it still looked very appetising to me. From then on, it became my mission to find out where it’s sold here in Singapore. But it wasn’t an easy task – this noodles is actually a Chinese dish but the Koreans loved it so much that they adopted it and started selling it at Korean restaurants. I couldn’t wait to try it so I thought I’d just make it myself. At first, I made it by instinct – mixed miso paste with soya sauce, mirin and the works. It was delicious no doubt, but I can’t help thinking if the authentic one tasted like this. So then I began searching for Black Bean Paste. I couldn’t find it in normal supermarkets – they only had spicy black bean sauce or black bean sauce with garlic, which was different. And so you can imagine how I yelped when I was at Square 2 at Novena this week and chanced upon a Korean Supermarket. Before you could say jja jang-myun, I was already in the shop, checking out the aisles, hoping to find my black bean paste and guess what? There it was, in all its brown tub glory, shining and calling out to me. hahaha… I grabbed it excitedly and couldn’t stop smiling. I loved the shop; wanted to buy almost everything! Known as Cha Jang Mian in Chinese cuisine, these noodles are a rarity here. Thank God I love to cook. I mean it’s times like these that I’m grateful for my enthusiasium for food. I don’t think I would have bothered trying to learn how to cook it if I was a lazy punk who eats out all the time. So anyway, I found a recipe off the net and decided to try it. I went with the Chinese version. I don’t know how much it differs from the Korean one, but I heard that it’s actually the same so there. I tweaked the recipe a bit because I didn’t have all the ingredients at home save for the paste, garlic, ginger etc. I used chicken instead of pork and bean sprouts instead of zucchini. Oh, and I used Capellini instead of Chinese noodles. I think it would taste better if it was la mian (hand pulled noodles) I was using. How did my virgin attempt at these black noodles go? Pretty well I must say. I was pleased with it. It was delicious and full of flavour. Sis commented that it actually tastes a wee bit like buah keluak (indonesian black nut). Maybe it did, but it was certainly tasty. The paste itself looked like buah keluak flesh actually! It was really black. But it’s okay, I like black foods – come on, yes, at first the colour might be off-putting but at the end of the day, why care so much when it tastes so good? That’s why me thinks squid ink pasta rocks too! Ta-dah… Okay this noodle dish is rather easy. I’m just happy that I have a tub of Korean black bean paste sitting in my fridge because I know that I can cook some jja jang-myun anytime I crave for it! *Look for this at a Chinese or a Korean Market. No substitutes! and garlic. Set aside. If using shrimp, shell, devein and salt lightly. Set aside. the size of the wok, you might have to do it in batches. Remove and set aside. the amount of the black bean paste, but don’t be too stingy with the oil. 4. Add the pork and stir fry till it is cooked, approximately 1 – 2 minutes. 5. Add the chicken broth. Bringt to a boil. 6. Add the shrimp, if using, and mix. 8. Serve immediately over cooked noodles. i think it’s called jajang myun in korean, almost similar as chinese. not jjang-myun. i love korean food!However, I never come across black bean paste yet, but maybe I haven’t looked hard enough. Thanks for the recipe. Btw, does it really require 1 cup of black bean paste? that sounds like a lot.. I love My Lovely Samsoon! And the guy is cute too! Like you, I pick and choose the shows. If the couple are not to my liking, I don’t watch it. Way too boring haha. But also I find their shows interesting as it always involves food. Try the Korean Mart in Burlington Sq. I find that’s my favourite shop for Korean stuff, and there’s one newly opened at Parkway Parade in the basement right between Lim’s Arts and Cold Storage. singairishgirl: oh yes, i’ve been to the one at burlington sq! but haven’t been back there. will check it out again. really? parkway has one? cool… it’s nearer to me. thanks babe. joannb: yes!! i watched that one too. the lead actor’s dad makes jja jang myun right? it looks so yummmmyy… which restaurant sells it? i have yet to find it out there.. that’s why I resorted to making my own. I just read your post, and when you mention the slurping on the TV series, it was exactly how sis and I felt! haha..
I’m in the Bay Area so there are a couple of places that have it out here. I just went on Yelp and did some searches for it. I ended up trying Tong Soon Garden in Santa Clara, CA. I liked my homemade version better. I watched Full House too. That made me want bibimbap so I had to figure out how to make it after the cravings persisted! I’ve also been watching and loving this particular drama for quite a few weeks now. Love the scenery and the unique female lead! No prob, Cheryl. Square 2’s is bigger than Parkway’s but you should be able to find the basic stuff there. I cant wait to try this! I was wondering if you have ever tried the korean vermicelli? Its very chewy and nice. I wonder if it would taste nice with this recipe? there’s a korean supermarket at Tanjong Pagar. The building across the road from Amara Shopping Centre. See quite alot of korean pple buy stuff from there, so I guess you may be able to get quite a good variety of korean products there. The shop name is in Korean too! It’s nice to hop to your blog once a while to look at all those delicious food you have here 🙂 Makes me hungry! k dramas… my favourite.. Once in a while, really need to go Korean restaurants to satisfy the need of korean delicacies..
Have you seen the Korean drama Jewel in the Palace? The first half is all about cooking in the imperial kitchen during the 1500s. Hi thanks for the Black Bean Paste Noodle Recipe. I’ve been searching the name of that chinese/korean noodles that I saw on the Korean Drama “Couple or Trouble” (Fantasy Couple). I have first seen that black sauce noodles back when I saw the korean drama “Memories of Bali”. Since then, I am craving for that black sauce noodles for a very very long time. Now I know what’s it called and how to cook it. What noodles is best for it? I really love chinese noodles or any kind of noodles (stir fry or with soup). By the way, I’m from the Philippines..Koreans, Korean Restuarants,Korean Shops/Groceries are starting to multiply and getting famous in here.. Goodluck to your blog site. wow! thankyou so much for the recipe! i have been craving for that black noodle thing since i watched Fantasy Couple. Seriously…noodle companies should get the actress for a commercial. sales would shoot through the roof! 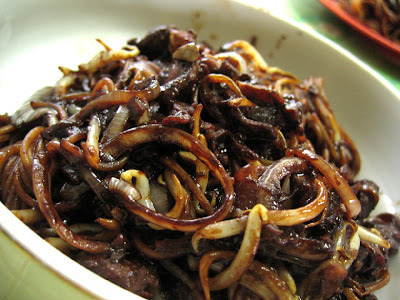 Hi, I chance upon your blog while looking for Jajangmyun recipe. I must thank you for the wonderful stuff on your blog. Can I add your blog to mine?? Thanks! great recipe…now all you need are some korean chopsticks…you can buy them at korean markets or online on ebay or komart.com. Muahahaha. I’m currently hanging/living in Korea right now (originally from Hawai’i CHEE HEE) and eating said jajangmyun as I type. Delicious. That being said/gloated, you can probably find the heat up stuff at a Korean store or beg the Korean lady on where to find the best jajangmyun. Nothing beats eating it from the Chinese or Koreans in the know-how. It’s like recreating your favorite dish at a restaurant. Something doesn’t feel right. hah it seems like Korean dramas are making lots of people hungry for this jjajangmyun! I am yet another person who hungers for it when I see it in my favorite dramas… Thanks for posting the recipe. I hope I didn’t scare the workers in my local Korean market too badly the last time I went in… I should probably try to learn some Korean so they can help me. lol! I am also inspired to make new foods that I first view in kdramas or japanese anime. I made korean green onion pancakes after watching a scene in Coffee Prince where they cook them together. hehehe. I also found this blog while looking for some recipes to make and slurp up while I watch Witch Hoo Yee. I think my own asian food/drama cookouts were first inspired by the anime Naruto… I could never watch an episode without wanting Ramen or (from later episode, the Curry of Life) curry. Hey! Since you’ve been at the Korean Mart at Novena 2, did you try to Korean restaurant? Its the one with the bbq and non-bbq section (I forgot the name). Its just next to that korean mart. Anyway I went there and my boyfriend (we watched Fantasy Couple together) and he immediately ordered the jajang myun. And it tasted great!! I only had a few noodles cuz he gobbled everything up. You can try there. Its a little expensive but I think that’s where its authentic. i think i know where to get this dish in restaurants.. haha.. if it is the 1 then i have been eating it for awhile without noticing..
its a chinese restaurant called ding tai feng.. that is actually more famous for its xiao long bao.. anyway.. they have e dish there n it is delicious.. didn’t dare to eat it at first as it is black.. lol.. but after trying it off my boyfriend’s bowl, i loved it so much that i swapped my food with him..
do try the xiao long bao too, they’re really good, and cheap too, better then most n i really love xiao long baos..
opps.. forgot to add.. this is assuming u r located in Singapore..
oyea.. there is an outlet at bishan (junction 8) and another at bugis junction.. i’m sure they have other outlets but i dunno where they are..
One important ingredient is missing from the recipe: sugar!! As you may guess, ‘ja-jang’ means fried bean paste. But sugar is what makes the Korean version different from the Chinese one. So the sauce should look like a melted caramel–fried black bean paste mixed with sugar. You can also buy ‘ja-jang mix’ (just like chicken curry mix powder) from any Korean mart. Just add meat and veggie will do the work. thanks for the recipe. Im really looking for this one since ive watched “Witch Yoo Hee” (Witch Amusement) I’ll make one as soon as I stumble upon some black bean paste. Btw, I’m from the Philippines. another thing…do you think I can just puree black beans in order to have black bean paste? Thanks again. Mmmmm, this is one of my favorites! I also liked My Lovely Samsoon and really enjoyed the recent drama starring Kim RaeWon called Gourmet. The first time I saw black bean paste noodles was when Rain ate the instant kind on Full House. I have since tried the pre-packaged ones – yum! I Look forward to trying your recipe – thanks for posting it! BTW, I am non-Asian from the US and so glad I found out about Korean dramas (and Korean music and food) – they’re great! Hi! 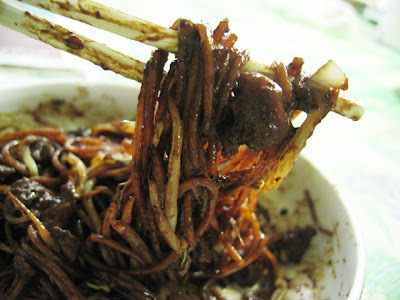 I also like jjajangmyun in Korea. I took your pictures to my blog without your permission. Forgive me, please. Good luck and have a nice day. 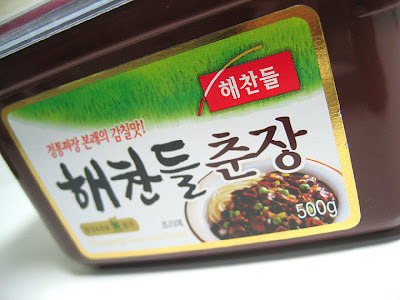 hi, i watch fantasy couple as well, and that jajang myun always stay on my head ever since, people say there's no jajang myun in korean restaurant in indonesia so i decided to make it, actually jjang instant is available in korean store, i will email u the recipe that i get, maybe u can try it too:) have a nice day!